The Collaboratory is reserved on a first come/first served basis. To make a reservation in the Collaboratory, fill out this form. Contact 210-567-2450 or email to AskaLibrarian@uthscsa.edu with questions. 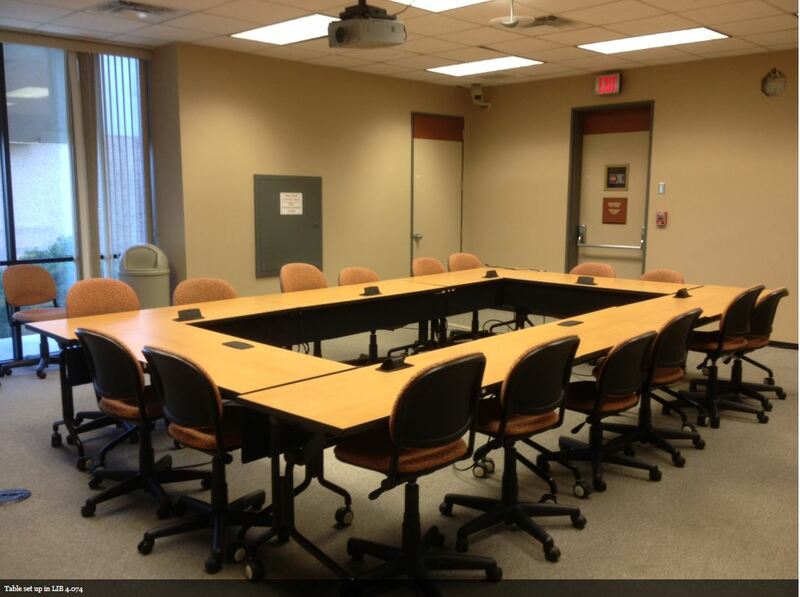 The Collaboratory may be reserved for group study on weeknights 6 pm - 7 am, and any time on weekends. The 4th floor is designated a Silent Floor and is a heavily used study area. Students have asked that persons entering and leaving the conference room be considerate, keep the door closed, and refrain from conversations until they have left the floor. Video-teleconferencing equipment. See the Classroom Support box below. Audio-visual equipment or technical support. Features: Room-wide wireless. LCD monitor and laptop. General conference/meeting room. Projector, phone line, whiteboard. Telephone not provided. Tables have built-in electrical outlets. Covered beverages and food are allowed. Catering: Library staff must be notified of any food deliveries and the approximate time of arrival. All food service items must be removed within 30 minutes after the end of the meeting. The requestor is responsible for making sure the all trash is disposed of in trash receptacles and that the room is returned to its original state. Spills should be cleaned up immediately, or reported to Library staff. Special software can be installed on the laptop with advance notice. See the Classroom Support box.